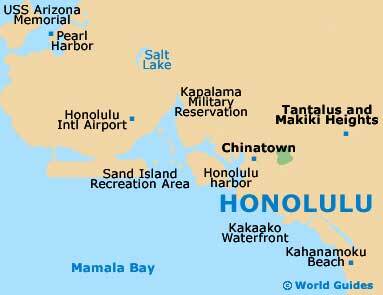 Honolulu comes with enough exciting manmade and natural landmarks to keep you busy for days. 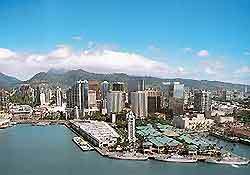 You will find many historic buildings, monuments, memorials and towers in Honolulu, such as the lofty Aloha Tower, striking contemporary structures including the State Capitol Buildings, and monumental cliff formations like the imposing Diamond Head crater. The 56-meter / 184-foot tower sports a couple of clock faces and a dome, and was once the tallest building in Hawaii. 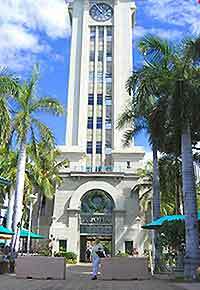 The tower is situated in the center of the Aloha Tower Marketplace shopping center and is hard to miss as the greeting, 'Aloha', is stamped on its sides. The Marketplace beneath the Aloha Tower has a wide selection of shops and eateries. Built in 1878 in Glasgow, Scotland, the Falls of Clyde is a fully rigged, four-mast ship that is the only one of its kind left in the world. The boat was used to carry sugar, tea and oil during its working life and also carried passengers between Hilo and San Francisco. As of late 2008 the Friends of Falls of Clyde (FoFOC) took over ownership of the ship from the Bishop Museum , inorder to restore it. Today, the Falls of Clyde remains moored in Honolulu Harbor. 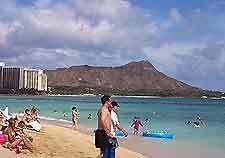 Created from a volcanic eruption about 100,000 years ago, Diamond Head was once used as a defense fort by US forces and offers fantastic ocean views. The summit can be reached via a spiral staircase and tunnel. Located on the cliffs of Diamond Head, the lighthouse was built in 1899 and rebuilt in 1917, and still uses the original Fresnel lens. The Diamond Head Lighthouse stands 17 meters / 55 feet tall and is completely automated, with the original lighthouse keeper quarters now home to the Coastguard commander. Site of the battle between King Kamehameha and the Oahu armies in the late 18th century, the Nuuanu Pali Lookout is a series of lofty cliffs overlooking the city. 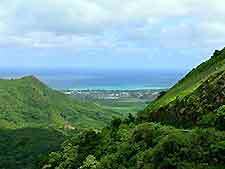 The Nuuanu Pali Lookout offers magnificent views of Honolulu, and also as far away as Kaneohe Bay and Diamond Head. Located behind Honolulu Harbor, the extinct volcanic Punchbowl Crater was once a sacrificial ground and also the site of many secret royal burials. The National Memorial Cemetery of the Pacific is the final resting site of thousands of service men and women. The Capitol building is a grand and unusual building with volcano-like legislative chambers and surrounding water that represents the Pacific Ocean. 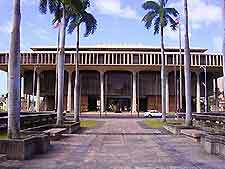 This fairly new structure replaced the beautiful Iolani Palace as the seat of state government in 1969 and is well worth a visit.